"The Tempest," by Thomas Cole (American, 19th Century), ca. 1826. Oil on panel, 18 3/4 x 26 inches. Purchase with bequest of Clarissa Hale Poteat. Object number: 1987.100. Courtesy of High Museum of Art. In January the Musée du Louvre in Paris opened “New Frontier: Thomas Cole and the Birth of Landscape Painting in America.” The exhibition is the first of a four-year collaboration devoted to American Art, with the Louvre, the High Museum of Art (Atlanta), Crystal Bridges Museum of American Art (Arkansas), and the Terra Foundation for American Art. In 1975 the Louvre acquired “The Cross in the Wilderness” one of only four paintings by an American Artist in the Louvre, and their only painting by Thomas Cole. The painting represents the culmination of the Cole’s reflection on the representation of a certain type of American landscape, both untouched and grandiose. Inspired by the sentiments expressed in contemporary American literature by writers such as James Fenimore Cooper and William Cullen Bryant, the works of Cole and those of his compatriot Asher B. Durand initiated a particularly new and fertile genre in the young school of American painting. In addition to the painting from the Louvre, five works drawn from the collections of the partner institutions have been selected for “New Frontier: Thomas Cole and the Birth of Landscape Painting in America.” These include the “Landscape with Figures: A Scene from The Last of the Mohicans” (Terra Foundation for American Art) painted by Cole in 1826 and considered one of the artist’s first masterpieces. As the founder of America's first art movement, the Hudson River School, Thomas Cole (1801-1848) is a central figure in the development of American culture. When Cole made his first trip up the Hudson River in 1825, thought-leaders were searching for something distinctly American to establish the nation's own culture as separate from that of Europe. 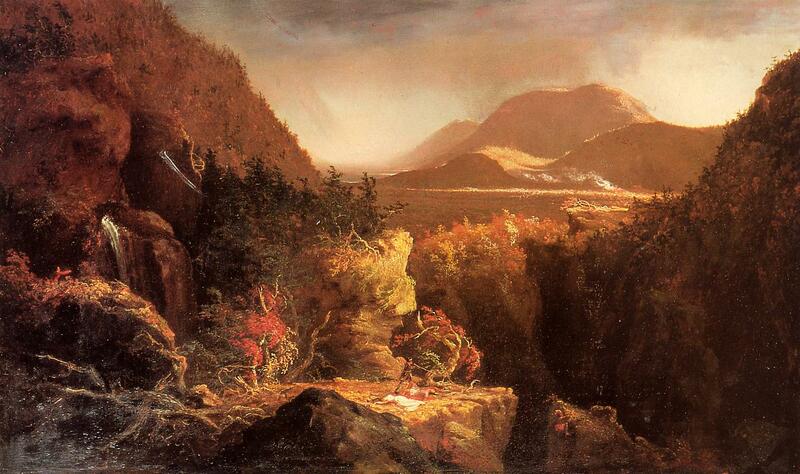 Thomas Cole found it in the Catskill Mountain wilderness, which came to symbolize the unspoiled character of the new nation. Lionized during his lifetime and celebrated by a generation of artists who followed in his footsteps, Cole is now widely regarded as the father of American landscape painting. The Thomas Cole Historic Site, historically known as Cedar Grove, is where the artist Thomas Cole lived, worked, was married, and where he died at the age of 47. Today the site consists of the Federal-era brick home (c. 1815) in which Thomas Cole resided with his family, as well as the artist’s original studio building, on five landscaped acres with a magnificent view of the Catskill Mountains.